ARD-19 was built in 1943-44 by the Pacific Bridge Co., Alameda, Calif., and was accepted and commissioned 22 March 1944, Lt. Comdr. P. D'Jurhuus in command. Following commissioning, ARD-19, a one-piece steel floating dry dock suitable for docking destroyers, submarines and landing craft, began her journey west to join ServRon 10. Self-propelled but unable to cross the ocean tinder her own power, she was towed, in stages across the Pacific. While in transit she was used as a van to help move the service squadron forward and at the end of August arrived at Seeadler Harbor carrying a YTL, 2 pontoon crane barges, and 20 LCMs and LCVPs. From Manus ServRon 10 provided the logistic support for the Palau offensive, then moved itself forward to Ulithi and Kossol Roads. The Leyte landings soon followed and the repair facilities were moved up to San Pedro Bay. On 27 November ARD-19 was moored in that bay with Ross (DD-563) in dock undergoing repairs. Shortly before noon the Japanese launched an air attack. A Tojo fighter crashed into the drydock, passed through the starboard wingwall of the dock, and caused gasoline fed flames to encompass the dock basin deck, searing Ross as they spread. As the fire was being contained another Japanese fighter commenced a strafing run, but was splashed by gunfire from the ARD, Ross, and LST-556. Heavy damage kept the ARD busy on self-repairs for only a brief time. She soon resumed her drydocking and repair role, and continued that service, at Subic Bay, Luzon, until after the end of World War II. In 1948, ARD-19 was towed back across the Pacific and on 29 October she reported for duty with the Pacific Reserve Fleet at Long Beach. For the next six months she operated tinder that command and ServRon 1, carrying district craft to various berthing areas on the west coast. In March 1949 she carried YFN-599 to Puget Sound, took on cranes and got underway, in tow, for the Panama Canal Zone. From the Canal Zone she continued on to Orange, Tex., with more district craft in her dock basin. Arriving 10 June, she continued her ferry service until decommissioned and assigned to the Texas Group, Atlantic Reserve Fleet for berthing, 30 September 1949. 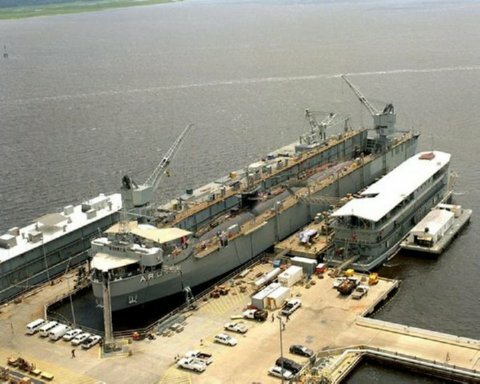 Thirteen years later, September 1962, ARD-19 was brought out of reserve and taken to Jacksonville, Fla., where she was converted, by the Gibbs Shipyards to a fleet ballistic missile submarine drydock. Her length increased to 536'1 and her displacement to 9,700 tons, she became the first mobile single unit capable of such docking. She was than named, redesignated, and recommissioned as Oak Ridge (ARDM-1), 1 October 1963. Further changes, such as the replacement of 2 ten ton cranes with 2 twenty-five ton cranes, kept her at Norfolk until 4 June 1964 when she was taken under tow by Atakapa to begin the long journey to her homeport of Rota, Spain. With Mahoa (YTM-519) in her dock basin, she arrived at Rota 22 days later and commenced providing the services, to Polaris submarines and others as required, which she has continued into 1970. ARD-19 received 1 battle star for World War II Service.